Cylindrical-Leaf Luisia is an erect, clustered orchid found growing on trees. Stem is up to 20 cm long. Leaves are 4-10 cm long, round in cross-section, pointed at tip, fleshy, sheathing at base. Flowers are borne in condensed racemes, in leaf-axils. 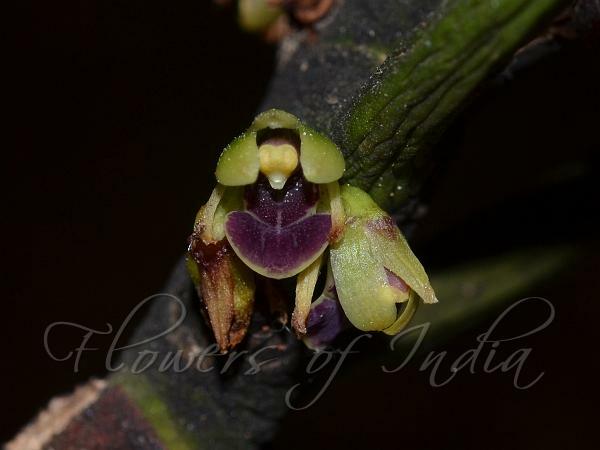 Flowers are 2-4, 5-6 mm long, greenish-yellow with purple tinge, bracts 1.5-2 x 1-2 mm, oblong, blunt. Sepals are about 5 x 1.5 mm, oblong, blunt, tip incurved. Petals are similar to sepals. Lip 4-6 mm long, oblong, concave towards the base, trilobed with dark maroon horizontal bands, mid-lobe rhomboid, larger than side lobes. Ovary about 2 mm long. Fruits 1.5-3.5 cm long, oblong. 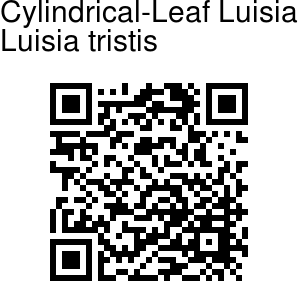 Cylindrical-Leaf Luisia is found in South Asia. In India it is found in Tamil Nadu, Karnataka and Kerala. Flowering: March-August. Identification credit: Ravee Bhat, Pankaj Kumar Photographed in Tamil Nadu.